Anarchists involved in struggles in the Rojava Revolution and their perspectives, plus anarchist views of the Yellow Vest/ Gilets Jaunes movement in France. This week on The Final Straw, the episode’s theme is anarchist interventions in struggles around the world. We’ll be sharing audios from comrades in the A-Radio Network, which just had it’s 5th Annual Gathering in Zurich, Switzerland. The A-Radio Network is made up of stations around Europe, plus a smattering in South + North America. We have been a member of the ARN for 4 years now, which over the last year and a half produces the monthly B(A)DNews: Angry Voices From Around The World news podcast in English, made up of contributions by A-Radio member-projects. You can find past episodes at our website. In lieu of this month’s BADNews, the gathering produced an 8 hour radio show last week and elements of this broadcast. We’ll present here two interviews from that broadcast concerning the struggle for autonomy in the social revolutionary region of Rojava, in northern Syria. The first is with a fighter with the Tekosina Anarsist (Anarchist Struggle, starts at 42:49) and the second with Zaher Baher, a member of the Kurdish Anarchist Forum in London (starts at 57:04). well as one from another an interview conducted a week ago with an anarchist in Paris, France, involved with the Yellow Vest (Gilets jaunes) social movement in France for some updates and perspectives. But first, we’ll be airing audio from another member of the A-Radio as well as Channel Zero Network projects, Dissident Island Radio from London in the U.K., with an interview about the geopolitics of Rojava and leadership within the Kurdish struggle with a comrade participating in the annual ‘Long March‘ in solidarity with Abdullah Öcalan (starts at 14:05). We apologize for the audio quality. We invite you to note the differences of opinion between the anarchists who’ve witnessed, lived in, or fought for the Rojava Revolution, as somewhere within and between their perspectives I believe lies some of the truth of the complex situation there. If you're listening to the radio version, please check out our online/podcast version up at our website for another 20 minutes of interviews plus the Sean Swain segment for this week. Friday, March 1st is the first Friday of the month and therefore the Trouble Showing at Firestorm Books and Coffee in Asheville, NC. Episode 18, entitled ACAB (for All Cops Are Bastards) airs at 6:30pm and will be followed by a little over an hour of discussion. Then, on Sunday March 3rd, as the 1st Sunday of the month, BRABC will hold it’s Political Prisoner letter writing event, again at Firestorm. The event begins at 5pm, letter writing materials including stamps, prisoners names and stories, addresses and help in writing. If you’ve never written someone a letter or someone in prison in particular, no worries. It’s a nice social time. The event runs from 5pm to 7:30pm. Finally, on Saturday, March 16th, Blue Ridge ABC is holding a double-header at Static Age Records in downtown Asheville. First up, from 3-5pm, a Super Smash Brothers benefit tournament, with vegan cheese-steaks and fries available. Double elimination, best 2 out of 3 rounds. 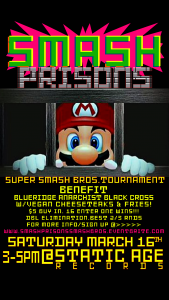 For more info, check out https://www.smashprisonssmashbros.eventbrite.com. 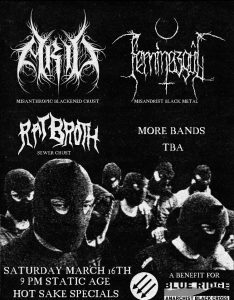 Then, from 9pm til late at Static Age, get ready for a lineup of anti-fascist metal including Rat Broth, Arid, and Margaret Killjoy’s project Feminazgul, plus more to be announced.